Group D action gets underway in Israel on Wednesday night and the hosts will be looking to continue their winning run of form. 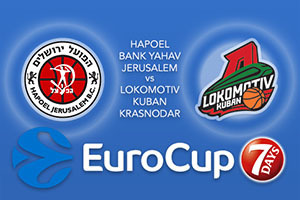 With a 2-0 record, Hapoel will have every confidence in this Eurocup game. The away side come into this match with a 1-1 record but they’ll know that they have a chance to make their mark on the outcome of this one, which will be the first time these two teams have played each other. The Israeli side have enjoyed a flying start to their Eurocup campaign and they’ll be looking to enjoy another comfortable night at home. If they do, there will be a very good chance that Curtis Jerrells will be involved with the process. This is because he is averaging 20 points a game so far this season, which is the fourth highest ranking in the competition. The hosts have also been boosted by Tarence Kinsey, who has provided an average of 16 points per game and Jerome Dyson, who has delivered an average of 11 points per game. If these players find their form, it could be a long evening for Lokomotiv. The side from Krasnodar come in to this game with a 1-1 record and they’ll be hoping to improve on that in Israel on Wednesday night. Taylor Rochestie is a player with plenty of European experience and he comes into this game with an average of 13 points per game. Kenny Gabriel is another player that has performed well for Lokomotiv so far this season and he has picked up an average of 12.5 points per game this campaign. Ian Vougioukas is another player that has performed at the top level in Europe and he is holding an average of 9 points and 8 rebounds per game. The home team are favoured by the bookies but this could be a tighter affair than some people think. You should look to take Lokomotiv Kuban at +6.5, which is provided at odds of 1.90. For the Over/Under market, look to go OVER 152.5 which you can find at odds of 1.90. Bet Now!